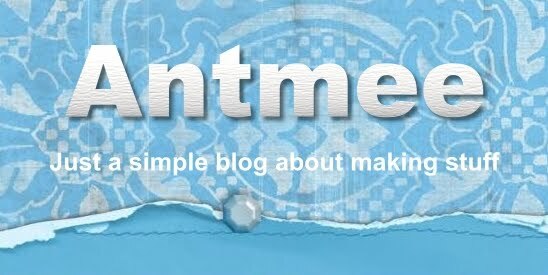 Antmee: Rushed, unplanned birthday gift. A pot holder I made. I wasn't planning on making any potholders and they definitely were not on my 'things to do' list. What was on my list of things to do was finish off those bunny softies from previous post. "Aunty Kylie! It's my mum's birthday today and I have no money to buy her a gift! Could we make her a heart or something?" Goodbye hand-stitching, hello surfing internet and browsing my craft books to find something to make. Something quick. These potholders from Martha Stewart fit the bill. The only down side was that by the time we found a project and selected some fabric from my stash, I didn't have much time left before her mother arrived to pick her up. I rushed the binding and just managed to take a quick photo before her mother made it out of the car and knocked on the door. 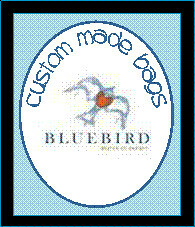 I am working again this weekend so plan on having a sewing day today, hand-stitching in front of the tv. Front door is locked, phone is off the hook and my mobile has been buried inside the linen closet! Maybe I should park my car in the next street over just in case? Sometimes it feels good to hide and just some things done. I love the pot holders. What a get idea. Pretty great for last minute, I'd say! And I bet that little girl was equally pleased as her mother. Now hide away and sew your hear out! I think it turned out cute! I really like the fabric you used. Take care and have a super weekend! 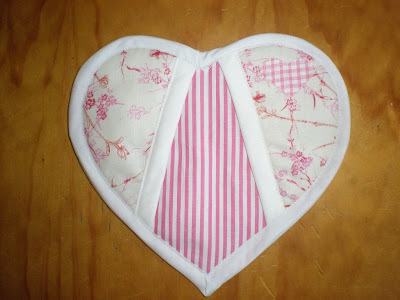 Really cute heart pot holders...bet you made someone very happy...actually two someones happy...mother and daughter. What a nice thing of you to do. The potholder is really cute, too. You did a great job all the way around. Lovely. I like the fabric you used for the back. No one's ever asked me to make something for her mom! Such a cute idea. I really like the fabric you chose. 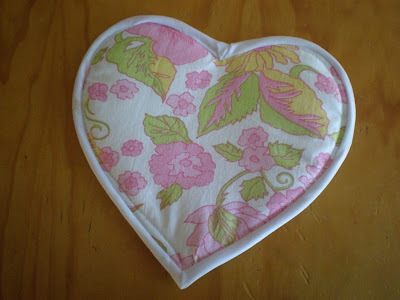 That is a really cute potholder and so good of you to whip it up so fast! Very nice! Awesome effort. Nothing like a tight deadline eh? Interesante trabajo, me gusta el resultado.